Great shot...question your use of the model. ???? Amazing capture, excellent exposure and detail! Great shot! The lighting is fantastic on the subject in relation to the background. Intrepid photo tour leader Mark Andreas Jones near the lighthouse at Keflavik, Iceland. February 2017. Nikon D810 14-24mm lens Main image of the sky f5 10 secs ISO800. Image of Mark briefly illuminated with a Lume Cube. #Mark Andres Jones by Keflavik lighthouse; Iceland; Photo Tour; February; 2017; Landscapes; Icelandic; Winter; Snow; Ice. I took this image on a trip to Iceland earlier this year in February. 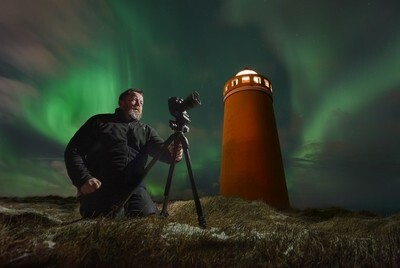 (2017) Intrepid photo tour leader Mark Andreas Jones by a Keflavik lighthouse. Composed from more than one image. One exposed for the lighthouse. One for the northern lights and also one where I lit Mark with a Lume cube held by a fellow photographer who I edited out later. Nikon D810, 14-24mm lens, Gitzo tripod, Lume Cube for lighting. Mark is a great character who has lead many trips to Iceland so I wanted to capture him against a back drop he loves. Yes...the image was conceived in my head and the elements were created on several images frames. One for the lighthouse, one for the northern lights and a separate one of Mark lit by a Lume cube. It was all processed in Adobe Bridge then combined in Photoshop. I normally carry 2 x Nikon D810's, , Nikon 14-24mm lens Nikon 19mm Tilt and Shift Lens, f2.8 lens,Nikon f2.8 24-70mm lens, Nikon f4 70-200mm lens. Tamoron 90mm Macro, Gitzo Tripod. 3 x Nikon SB910 flash guns. Plan the shot using a tripod to maintain the image frame. Experiment with different speeds etc to capture and harvest as much detail as possible. Compose in Photoshop with masks and layers.